Cover image: Book of Mormon Central composition of the Tree of Life by Krista Maureen Jones and El sueño by Jorge Cocco. In 1 Nephi 8, father Lehi told his family about a dream that he had in which he saw the tree of life. Towards the beginning of that dream, he had been following an angel when he suddenly found himself “in a dark and dreary waste” (1 Nephi 8:7). He then noted that he traveled for many hours in this terrible darkness until he finally “began to pray unto the Lord that he would have mercy upon me, according to the multitude of his tender mercies” (v. 8). The lines in both 1 Nephi 8:8 and Psalm 51:1 are expressed in the form of a prayer. In this basic sense, the contexts of the two are similar. Psalm 51 is known as a penitential psalm, a psalm of repentance, and is traditionally associated with King David’s plea to God for mercy and forgiveness after the Bathsheba incident (see the heading to Psalm 51). Lehi cries out for mercy and relies upon the “tender mercies” of the Lord, but there is no mention of transgression or repentance on Lehi’s part. However, the fact that Lehi described the place in which he finds himself as “a dark and dreary wilderness” (1 Nephi 8:4) and “a dark and dreary waste” (1 Nephi 8:7) in which he “traveled for the space of many hours in darkness,” suggests that his dream begins in a dark and evil place. Despite the fact that he is accompanied, early on, by a heavenly guide dressed in white, he travels for many hours in darkness and feels the need for God’s deliverance. This place of darkness and dreariness is set in contrast to the light and joy that are associated with the tree of life. Furthermore, the initial discussion of the dark and dreary wilderness is parallel to Lehi’s mention of his sinful and rebellious sons, Laman and Lemuel. Psalm 51 presents the psalmist’s journey from sin and evil (vv. 3–5) to wisdom, purity and joy (vv. 6–8). When Lehi comes out of the darkness and is blessed to partake of the fruit of the tree, he then desires to share the fruit with his family. In the psalm, David commits to “teach transgressors thy ways” and convert the sinners unto God (v. 13). 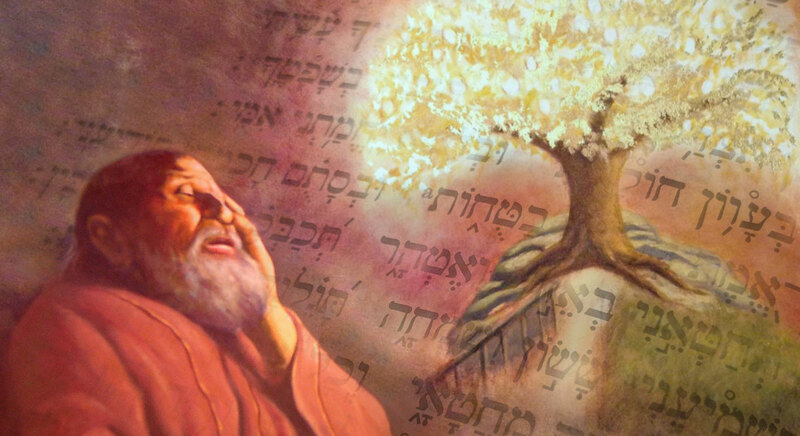 There is a very interesting parallel in the comparison between Lehi’s journey to the tree of life and the psalmist being taught “wisdom” in Psalm 51:6. Taking into consideration Proverbs 3, we see that the ancient Israelites saw a relationship between wisdom and the tree of life. Proverbs 3 praises the virtue of finding wisdom: “Happy is the man that findeth wisdom … She is a tree of life to them that lay hold upon her: and happy is every one that retaineth her” (Proverbs 3:13, 18). In Lehi’s dream, the fruit of the tree of life also brought profound happiness (1 Nephi 8:10, 12). It seems very likely that either Lehi, in his retelling of his dream, or Nephi, in his abridgment of his father’s record, had Psalm 51 in mind. Lehi repeated, almost verbatim, David’s plea for mercy from this psalm. Thereafter, several key words and themes in 1 Nephi 8 also can be found in Psalm 51. If, indeed, Lehi/Nephi meant to allude to this psalm of repentance, then it should be considered a key (perhaps one of many) to understanding the meaning of Lehi’s dream. In Psalm 51, the journey from darkness to light, or from sin to righteousness, begins with earnestly seeking the Lord’s grace and mercy in humble prayer. There follows a candid admission of sin against God. There is talk of being cleansed with hyssop, of offering “a broken and a contrite heart” (v. 17), and other imagery that was associated with sacrifice and atonement in the ancient temple rituals. The psalmist desired to be forgiven of his sins and knew that God could do this by means of the atoning sacrifice. He promised: “Restore unto me the joy of thy salvation … Then will I teach transgressors thy ways; and sinners shall be converted unto thee” (Psalm 51:12–13). When Lehi prayed for mercy in the dark and dreary wilderness, he was shown the tree “whose fruit was desirable to make one happy” (1 Nephi 8:10). When he ate the fruit, Lehi said that “it filled my soul with exceedingly great joy” (1 Nephi 8:12), which is similar to the “joy and gladness” that the psalmist looked forward to with the forgiveness of his sins (Psalm 51:8). After Lehi received this great joy for himself, he immediately started looking for his family, including Laman and Lemuel, the most notable “transgressors” among them. He desired to teach them, to share this most desirable fruit with them—“but they would not come unto me and partake of the fruit” (1 Nephi 8:18). As Nephi later related, the tree of life represented “the love of God, which sheddeth itself abroad in the hearts of the children of men” (1 Nephi 11:22). Nephi further saw that the tree represented the Son of God, who “was lifted up upon the cross and slain for the sins of the world” (1 Nephi 11:33). Psalm 51, or at least parts of it, was likely well known to Lehi, Nephi, and their family. They would have recognized it as a desperate plea for forgiveness, and the hope of a man who had committed great sins. He desired that the Lord would create in him “a clean heart” and “renew a right spirit” (Psalm 51:10). Certainly, this is also what Lehi wanted for his family, and especially for Laman and Lemuel. Book of Mormon Central, “What Fruit Is White? (1 Nephi 8:11),” KnoWhy 10 (January 13, 2016). Mark D. Ogletree, “That My Family Should Partake,” Religious Educator 17, no. 1 (2016): 92–107. Jeanette W. Miller, “The Tree of Life, a Personification of Christ,” Journal of Book of Mormon Studies 2, no. 1 (1993): 93–106.